Olympic bronze medallist Joanne Jackson hosted an evening event at Worthing Swimming Club earlier this month. Jackson, who finished third in the 400 metre freestyle at the Beijing Games in 2008, was joined by sports psychologist and land trainer Harry Needs for a fun-filled time at Splashpoint. Both guests posed for pictures and led a presentation in the opening hour, before swimmers went for a land warm-up with Needs. Worthing members came out in great numbers for the evening with 67 taking on tips from Jackson. After the opening hour, two groups were formed with one team spending time in the pool with Jackson, while the other half were studio-based alongside Needs. Swimmers were then treated to a starts, turns and freestyle session by Jackson, then Needs led a general swim preparation talk. Having taken everything on board, all members at Worthing should now be better equipped going into competitions with the aspiration to one day follow in Jackson’s footsteps, competing at an Olympics. Worthing were well represented at the Sussex County long-course Championships last month. The competition, which took place at the K2 Stadium in Crawley, saw Worthing collect 70 medals in total from 11 different swimmers. Of those 70, there were 16 gold, 32 silver and 32 bronze medals. 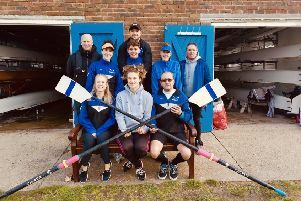 The impressive haul was enough to see Worthing finish seventh overall, eighth in the boys’ age-group events and sixth in the girls’ category. Head coach Chris Luesley was pleased with the performances of all Worthing’s swimmer and said: “I would like to congratulate all our swimmers for their efforts in these championships. “Due to problems at Crawley, we had limited access to long-course training over the last few months. “It was fantastic to see so many different swimmers (ten) reach finals and to win so many medals.